Lots of information about glow and glow2 trickling through twitter recently. There seems to be a change in timescale for Glow2. This was discovered: View Notice – Public Contracts Scotland which is a strange way to find out about the change, especially after Mike Russell’s initial announcement how Glow will be developed in September 2012 on YouTube. That announcement and the following summit last October lead me to expect more regular and open engagement. Glew is beta software of a single sign-on framework which can be used to integrate Google Apps for Education and other services such as WordPress Blogs, Media Wiki, Moodle and many more. 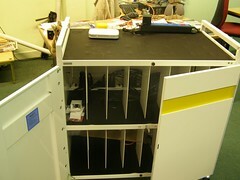 This is a test site so please accept that authentication and users may be removed during testing. I highly recommend you pop over to Glew and have a look around. Hopefully the 15 months that the Government have to work on glow will let them build something like this, if I was the Cabinet Secretary I’d give Charlie a call. 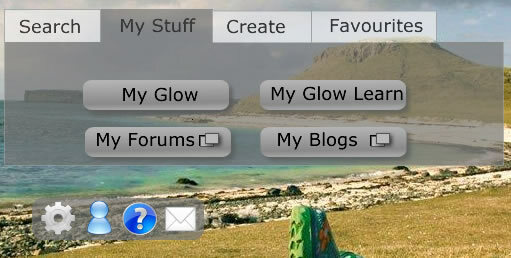 Glow Light is a new alternative Glow interface designed with a simpler ‘splash’ page. This ‘splash’ page will display a list of user specific links to allow easier navigation to other areas within the Glow portal. 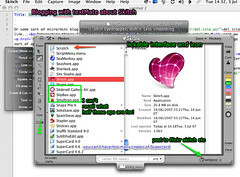 LTS have a video to show how it works:Glow Light – Making Glow better clicking on the thumbnail above will show a full-sized screenshot. Showing glow light is just over half the load of the Staff page. The search is much better than the old glow search. 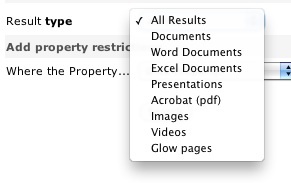 When you get to the results it gets even better linking to an advanced search with allows you to filter by type, and by various properties. The search is pretty fast (on the bases of a few Saturday tests). I never used the old search finding it nearly worthless, this new one looks like it will be valuable. 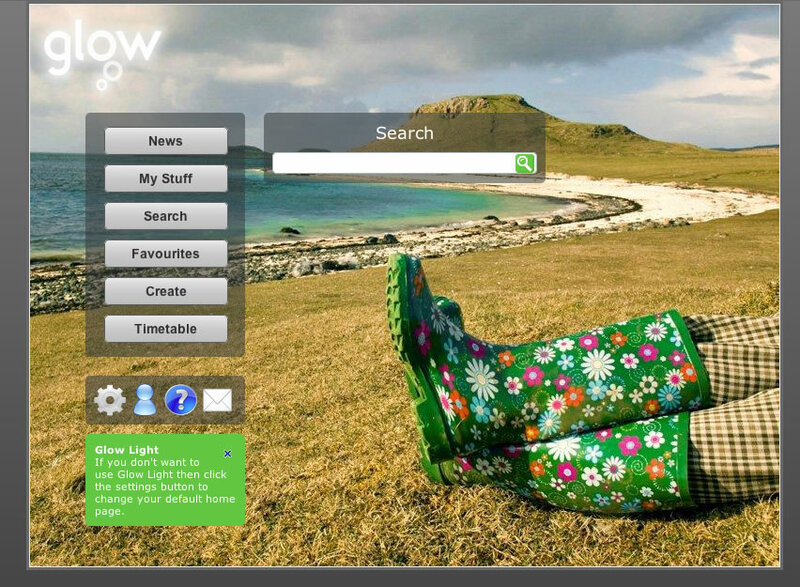 News: links to the old Glow Staff home page. My Glow: opens the my glow page. My Glow Learn opens the glow learn page. My Forums: opens the forums in a new window. My Blogs: opens your list of blogs in a new window. Search: shows the search box as it is hidden when ‘My Stuff’ is clicked. Favourites: opens your list of glow groups. Create: shows buttons to Create Glow Groups and Glow Learn Courses. 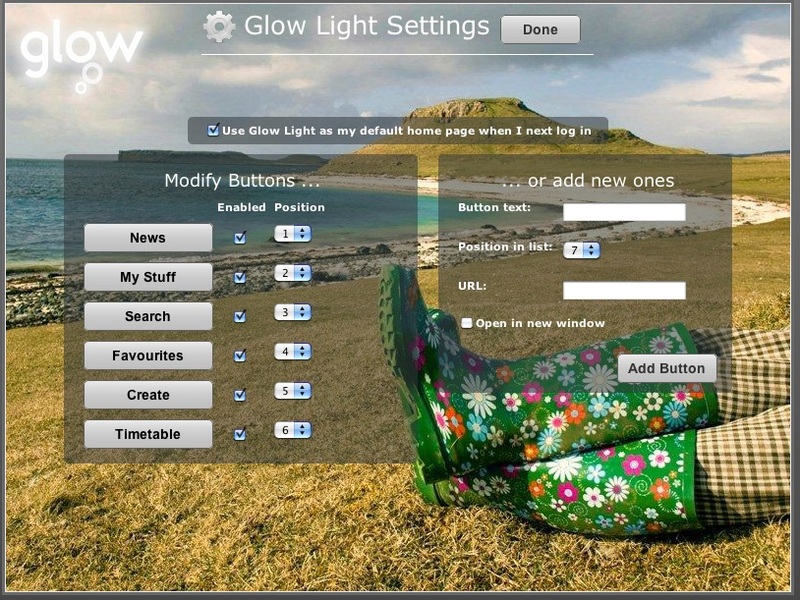 The Glow Groups button shows, or loads, a list of groups where you can create groups, clicking on the list opens the Create Glow group page for the group selected. Timetable: opens your timetable page. These are frequent tasks inside of glow and in the past would take quite a few click to get to. You can customise the lists of buttons from the setting and add ‘link’ buttons of your own to the list. I ‘ll probably turn off the Timetable as I don’t have any classes and the Create button as I would normally work down to the site I am creating while I think about it. There are 4 smaller buttons at the bottom of the main list: Settings, which opens the glow light settings. Profile, Help and Mail which are self explanatory. I like the way the create button loads the groups list on the page and although I don’t think I’ll use it I’d like the favourites button to load my favourites (and just my favourites) in the same way rather than take me to my ‘My Glow Groups’ page. This is pretty quick and dirty but should illustrate the idea: Tabs hide an reveal elements and action buttons show if the link is in a new window or not. The future of glow is looking a bit brighter, this is a long overdue facelift and perhaps indicative of the way glow is going. It now is starting to look like hub linking out to different services: glow, blogs (these were updated yesterday too, forums, glow learn and mail. The move to using open source, (phpBB, WordPress) familiar web tools is surely a move in the right direction. I hope too glow will move in the direction of constantly upgrading, or perpetual beta that is popular with open source and web technology (google, flickr) generally. Five years ago I had no idea what sort of web applications I’d be using now and I hope that the next 5 years will bring improvements and completely new ideas. If glow was a portal they services could be easily added when necessary we could have phpMotion ( a youtube clone) or laconi.ca (a twitter one) dropped into glows safe & secure environment at the drop of a hat. Glow Futures will apply open standards aiming to achieve unhindered data flow and interoperability. This model will help Glow to constantly evolve and remain modern. The current Glow portal and data centre infrastructure is provided by a single supplier. We envisage that the new service could be procured in a series of lots which may be provided by a single supplier or by a variety of suppliers to allow for a flexible and dynamic approach to respond to evolving requirements. Gives me a fair bit of hope. I just hope we have, in Scotland, enough money to resource it and the hardware to use it. A while back I posted a quote from the guardian The long tail of blogging is dying which put forward the idea that a lot of blogs were going away as twitter and other easy stuff took over. Commenting was on the way out as tweeting a link or quick comment requires little work. I think that is what is happening to me, it has been 4 weeks since I posted here, in that time I’ve made half a dozen or so posts to John’s posterous (very easily done) and at least 100 tweets. In that time I’ve had ideas for about half a dozen blog posts, this being one. While it is easy to blog in my head, getting it into a fashion other will be able to read it take time, other things are easier. Twitter seems to me to be affecting two aspects of blogging, commenting and reading. Because of Twitters live constant scrolling feed, we also talked about how the “life span” of a blog post is shrinking. I use to get comments on a blog post lasting weeks. Now I post a blog, it gets a comment or maybe two in a the first 10 minutes, gets retweeted for about 20 minutes and then it’s old news. is a little worrying blog posts have always been in danger of being forgotten due to there date stamp, but 20 minutes is quite a short life span. Graham Wegner’s Post explains how he is not too worried about this, happy in his own place (and quotes a nice cartoon), much struck a chord with me and started me thinking about my own blog/tweet mix. I’ve noted over the last year or so, posts that attract a fair number of tweets and no comments. These tweets, like comments can add value to a post, but are now lost or at least disconnected from the original post. I’ve not seen a good tool to aggregate tweets and add them to a blog post. Posterous has quite a nice facility in its comment system, you can tweet the comment, but it would be nice to see the opposite, the creating of comments by tweets. My own commenting has shrunk and I am now making a more of an effort to comment rather that just think/tweet about it. I do much of my blog reading via NetNewsWire which helps me keep up with quite a few blogs and store various posts (like the one quoted above) for later though and re-reading. 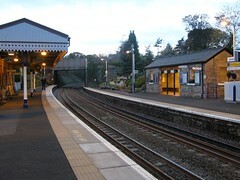 I when I changed jobs I had even more time on the train to keep up with my feeds, but I am now driving most of the time and starting to rely more on twitter for posts to read. This can lead to missing many valuable things, if something is tweeted and not blogged it can disappear very quickly indeed, especially as we seem to be following more and more folk. Today I read a blog post Catch Up Post – Part 2 – #weather_me « The H-Blog pointing to weather tweets in UK. which looks like a fantastic resource for discussing weather in the classroom. Following links to the developers blog I found a thank you to many twitter users for feedback and suggestions. I estimate I know about half of these but had missed all the tweeting that must have gone on a month ago. I also had not added the blog to NetNewsWire, I’ve done so now. 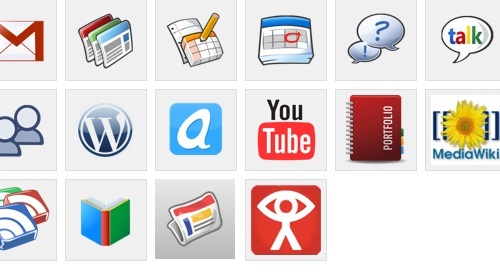 The blog is also one of the Scottish EduBlogs not listed, as far as I see, on ScotEduBlogs. I’ve had the same experience many times, finding a link from tweet by someone who is not usually awake at the same time as me and following the trail. This makes me wonder how much more I miss. Of course twitter is in a lot of ways useful easy and fun, from the now 14 posts here tagged twitter I’ve had a lot of value from twitter and its API, but I am wondering how to make the best of both worlds. Check my feed reader more often. Add blogs to my reader when I find them from twitter. Comment more, if appropriate invite bloggers to add their blogs to ScotEduBlogs. Add my delicious Network‘s RSS feed to newsnetwire. Use TweetDeck‘s filter feature to filter out links from various columns especially favourite tweets which I use for bookmarking. Work out a better system for following the comments of posts I am interested on. I suppose there are now teachers whose first contact with Web 2 is twitter rather than blogging, this gives me a strange sensation, and makes me wonder what is next? Twitter image Mirjami Manninen from smashingmagazine. I just spent a few minutes at Sprout Builder which seems to be another way to build widget. Sprouts are interactive and portable chunks of web content. Some people call them widgets, mashups or mini-sites but we just call them sprouts. I have not really tested may of these types of service, but it only took me a couple of minutes to build a ScotEduBlogs feed widget. It looks like you can do a lot more with sprout builder than just pull a feed. some of the examples include audio and slideshows. The sign up made me admit I was over 13 so not something for the classroom, but it might allow you to make something for you classes. There seems to be a ton of embedding options, click on the share button to see them. You can add to facebook, myspace, iGoogle etc. or get an embed code for a post or webpage. Feel free to embed ScotEduBlogs on your site, or better make a slicker one for the ScotEdublogs community.